On this trip we had onboard the scientists and supporters of the MCSI (Marine Conservation Science Institute). This is the institute that researches the population of our Guadalupe Island great white sharks with the Guadalupe Shark ID program (and photo book) and studies the migration patterns. So far there are about 270 sharks in the identification book with around 30 new ones added each year as they are spotted and photographed. 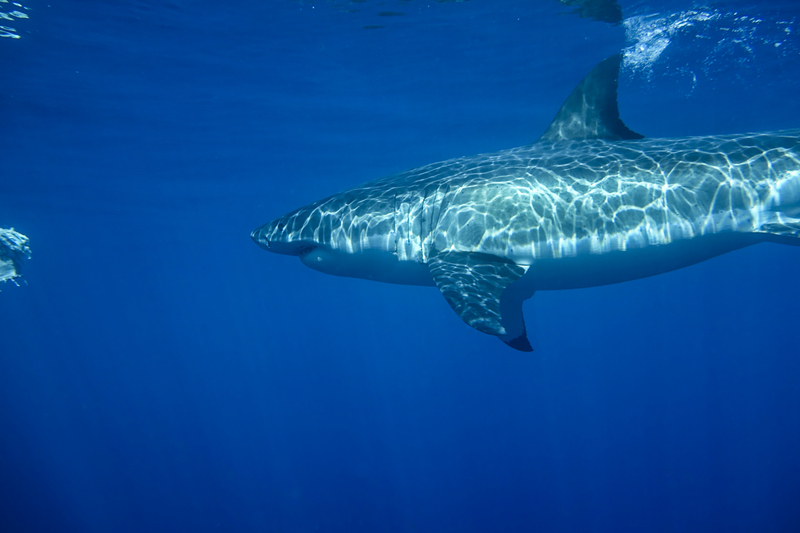 Male sharks can be seen around the island each year between July and December, whereas mature and larger females arrive later in the season, around September. Females who are reproducing will only show up every other year as they are staying away from aggregations during their pregnancies. 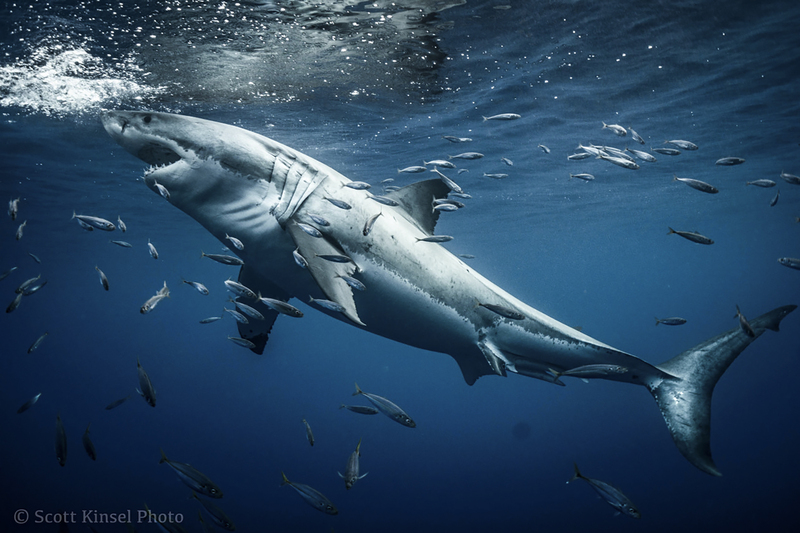 And as great white sharks are pregnant for 18 months (!) this makes them return to Guadalupe every 2 years ideally. Therefore, and because of sightings of fresh mating scars on our larger females, Guadalupe is thought to be a mating site. Amazing what you can find out with ID photos and simple satellite tags! If you join us on one of our trips to Guadalupe, not only will you be able to meet our famous sharks like “Lucy” or “Scarboard,” (possibly, it is Mother Ocean after all), you might even be lucky enough to spot one of the new, unidentified sharks, take a nice shot and name the shark like a few of our guests did on this trip! How exciting!!! Hola amigos! This was my second trip to Guadalupe and my experience on the Nautilus Explorer was nearly perfect in every way. The captain and crew were outstanding! They took such great care of us and did everything they could to ensure that we had a spectacular experience (while keeping us safe, of course!). The sharks were simply magical. Having Michael and Nicole on this trip was the icing on the cake. They were so patient with all of us and our incessant questions. I am grateful for the privilege of being here and humbled by the tireless work of the MCSI. Until next time, Nautilus Explorer! We just finished one of the last trips of the 2018 season to Guadalupe Island, and it was a very special trip because we had on board the scientific researchers from MCSI, Michael Domeier and Nicole Naisby Lucas, who are some of the main scientists in the world for the great white sharks. They are the people in charge of the photo identification guide for the white sharks of Guadalupe Island that all the boats use to identify the sharks that we see every day! As I say it was a privilege to have them on the Nautilus Explorer, along with a group of 23 other people who came on this specific trip to support the MCSI and raise funds for their research. We had scientific presentations every afternoon in which Michael and Nicole taught us about the methods they use to investigate the sharks and everything they have learned about the Guadalupe great white sharks in the past 16 years that their project at Guadalupe has been running. We learned many new things about sharks, we had lots of fun with the guests and we got to see many sharks and identify 4 new sharks in the island (2 males and 2 females) that were named by the guests and will be in the new photo identification guide for the 2019 season. To be honest it was very special for me to share a trip with these researchers that I know from National Geographic documentaries, they are like science Rock Stars!! That is all for now from the Nautilus Explorer, follow us for new adventures! It’s not often, if ever, you get to tell your friends and family that you are going to swim with great whites off of Guadalupe Island! Then of course you have to clarify the facts! Swimming…um, no! 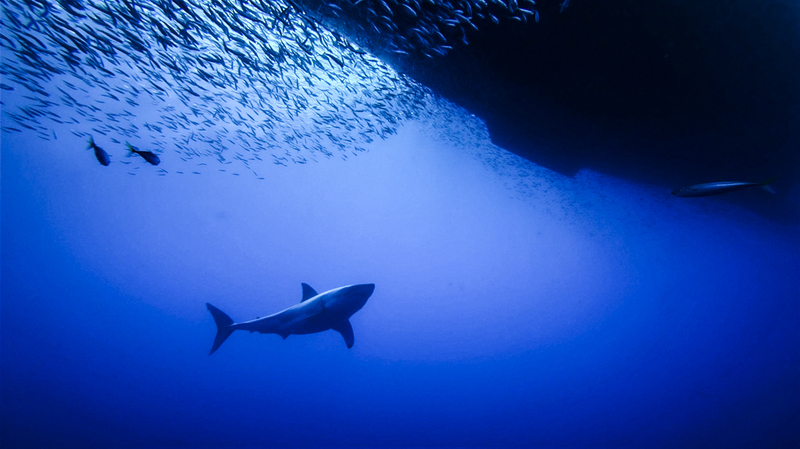 Shark cages…yes!! We signed up for this trip a year ago so have had plenty of time to think about it. 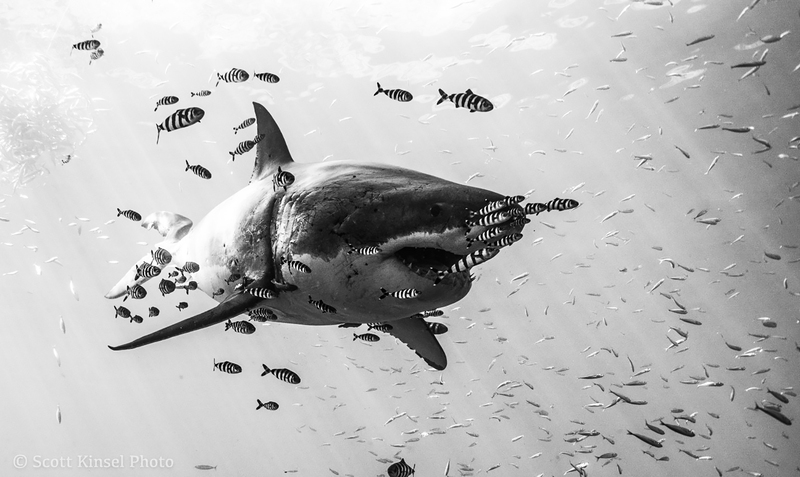 What do great whites look like up close? Will I be afraid? What will it be like in the cages? What will the ship be like? Are the beds going to be comfy? Food? Crew? You get the picture!! Actually, if you have never been on a Nautilus adventure, you won’t get the picture until you actually do it. There are many words I could use to describe this trip but the first one that comes to mind is simply AMAZING. Everything about it was beyond my wildest expectations. Having Nicole and Michael from MCSI on board was the best. Not only did we get to hang out in the deep blue gorgeous ocean with these beauties but we got to learn so much about them. Who knew that great whites give birth to babies that are already 5ft long? That swim thousands and thousands of miles to breed and give birth?! That are so stunningly gorgeous they take your breath away when seen up close and personal? The list goes on and on. And the crew…WOW! They went above and beyond all expectations with their amazing work ethic and dedication to making our time on board and in the water the best it could be… a huge compliment to Captain Lowell. Thank you to all for making this trip one of the best ever. And yes, the beds are comfy!! This past trip, “Lucy” was present with more than 50 pilots fish around her. 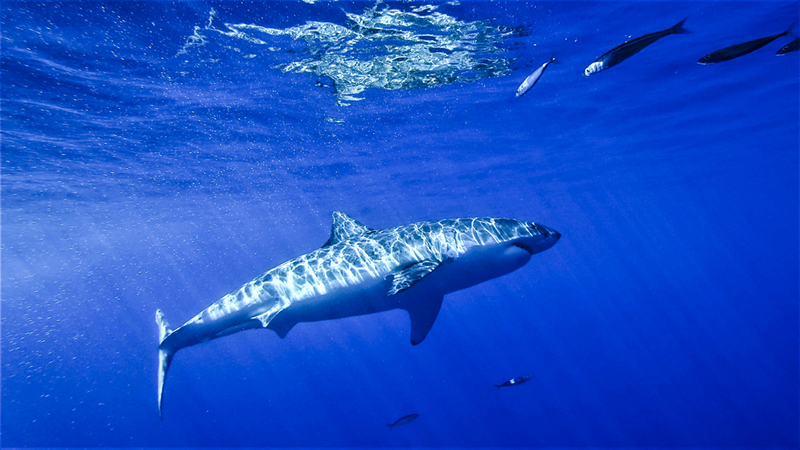 She is pretty, smart, quiet, and amazing, just like Guadalupe Island. This place is magic with more secrets in its waters, that is the reason that the great white sharks choose this place (in my opinion). Guadalupe is magnificent! GREAT crew doing GREAT work to let you experience a GREAT trip to Guadalupe! Never thought I would see GREAT white sharks with my own eyes. Wonderful, impressive and breathtaking! Especially “Lucy” of course!